After launching the program the icon appears on the task-bar (usually next to the clock). 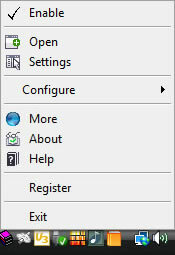 Right-clicking on the icon opens the program menu. Left-clicking on the icon opens the Lookup Bar. Lookup Assistant allows search access to online resources via Lookup Bar and Context Menu. The lookup results are shown in the multi tab docked bar holding the lookup history or in the default web browser at your option. The result bar is the floating bar docked to a screen border. The bar opens automatically when a new lookup is made, or it can be re-opened by navigating to the "globe" icon at the docked screen border. The bar is kept visible while the mouse pointer is inside the bar. Moving the mouse outside the bar closes the bar. If you click the bar, the bar is kept visible until you click anywhere outside the bar. The bar is resizable by dragging the bar border opposite to the docked side. The bar can be re-docked to another screen border by dragging the opened bar by the title to the desired screen side. If you highlight and click (or type in the Lookup Bar) an arithmetic formula, the formula will be calculated via standard windows calculator and the result will be copied to the clipboard. All the operations are available in mostly any application including text editors, web browsers, spreadsheet programs, e-mail programs and so on. You can use lookup configuration wizard to add your own lookup resource(s) to use with Lookup Assistant including Map, Mail/Site/IP address, ZIP Code, Patent, People Lookup and so on.